*** In 1950 there were 2 subsequent mono LP reissues by Dial, DLP 901. PLEASE NOTE THE DIFFERENCE AS THE REISSUE has a RED LABEL with a YELLOW CIRCLE and the "EAR" is etched in the deadwax. The REISSUE LABEL states "Contemporary Classics" and lists song titles as A-1 THRU A-6 and side 2 is b-1 THRU B-7. UNLIKE THIS ORIGINAL, YELLOW/BLACK LABEL with matrix on label and etched in Deadwax(DLP 21-22). All tracks are very detailed as to track cuts and there is No Ear. 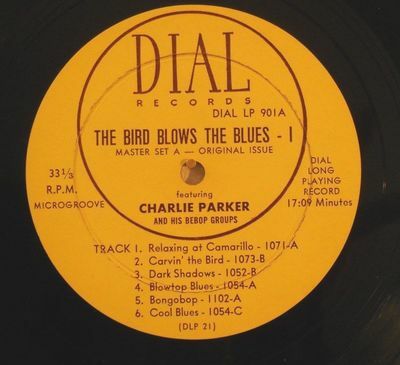 "THE BIRD BLOWS THE BLUES is a double collection of Charlie Parker improvisations on the traditional 12-bar blues theme, made with a variety of accompanying personnels. This unusual long-playing record has been prepared expressly for collectors. The 901-A side consists of the original first master selections as issued by the DIAL label on 78rpm and 10 inch records. The 901B side consists of previously UNREALEASED second master selections of the same tunes. It was the FIRST LONG PLAYING JAZZZ RECORD TO BE PLACED ON THE MARKET BY ANY COMPANY (July 1949) and has been in steady demand among musicians and collectors. It is also PRECEDENT-SETTING in that it was the FIRST TO UTILIZE THE LONG-PLAYING MEDIUM FOR COMPARISON of PARALLEL PERFORMANCES of a great jazz artist"
EXTREMELY RARE! LTD RELEASE! BEAUTIFUL CONDITION, FROM A PRIVATE COLLECTION. DLP 1 and DLP 21/22 are ORIGNAL ISSUE, 1949, "BIRD BLOWS THE BLUES".